Pedro Pascal as Ezra and Sophie Thatcher as Cee in Prospect. Once upon a time, the western parts of the United States seemed as foreboding as other planets do now. Prospect is the latest in a long line of scifi movies and shows to connect the frontiers of Old West to those in deep space, but it does so in a way that feels… unhealthy. Directed and written by Chris Caldwell and Zeek Earl—and expanded from its origins as a short film—Prospect is essentially a film about a gold rush in space. 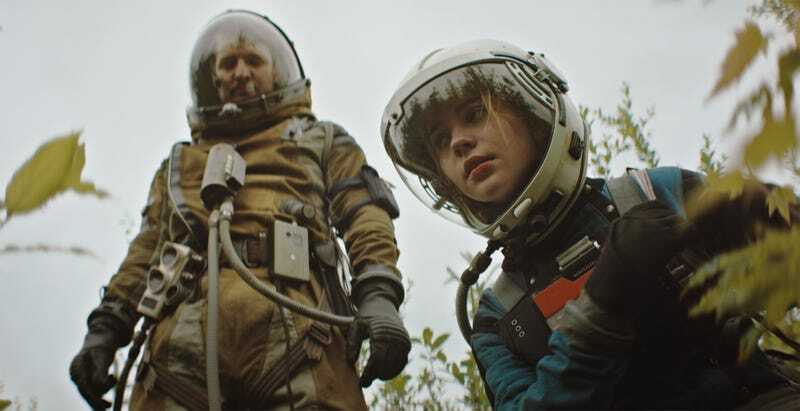 The film opens with main character Cee (Sophie Thatcher) and her father Damon (Jay Duplass) in a grubby two-person drop-pod, preparing to make planetfall on a moon with valuable precious resources. Surly teenager Cee is nervous about the whole endeavor but Damon’s convinced this is their path to a better life. Soon, the pair find themselves facing challenges and individuals they hadn’t accounted for—and the struggle quickly becomes one that’s not for riches, but for mere survival. The dialogue in Prospect unfurls in the kind of flowery courtly cowboy argot found in Deadwood and, yes, Firefly, but there’s lots of multisyllabic pseudoscience technojargon thrown in, too. For me, the mix is more intriguing than off-putting, especially since the story moves through the sorts of tense alliances, culture clashes, and dysfunctional border societies that are common in this kind of story. I liked Prospect more for its performances and visual textures than any particular interpretative angles it finds in its space Western mash-up. As Cee, Thatcher delivers a performance that makes you feel the churn of clashing adolescent emotions. She’s wary of her grieving father’s judgment; yearns to lose herself in cleaner, less complicated fantasies; and tries to hide the fear and revulsion that make her vulnerable in a place filled with killers. Pedro Pascal (Game of Thrones, and soon to be Wonder Woman 2) is leeringly hypnotic as shady prospector Ezra, gamely inhabiting an operator who keeps signaling a code of conduct you can’t ever be sure he’ll stick to. This is a sci-fi environment that feels like it’s been ridden hard and is on its last ornery legs... you want to know more about how this world got so weary. There’s a meticulous level of care and craft in the sets and environments. Everything is dirty and grungy. The air on the moon is laden with dust and spores, all the spacesuits look like secondhand refurbs and the analog user interfaces for equipment seem to be not entirely functional. This is a scifi environment that feels like it’s been ridden hard and is on its last ornery legs; the grime overlaid on everything makes you want to know more about how this world got so weary. The proceedings are quiet and spare, lending a meditative air to a really fraught journey. Prospect isn’t going to fill the Browncoat-sized hole in your soul, as the indie production isn’t quite as grandiose as Joss Whedon’s fondly remembered frontier space opera. It’s telling a more tightly focused intimate story about how necessary it is to find one’s own ruthlessness in a place where the usual moral poles have been abandoned. If you want to journey through a hostile ecosystem with a handful of burnt-out planet-hoppers, hitch your wagon to Prospect. Prospect screened at SXSW 2018 this March and, as far as I know, does not yet have a distribution deal.